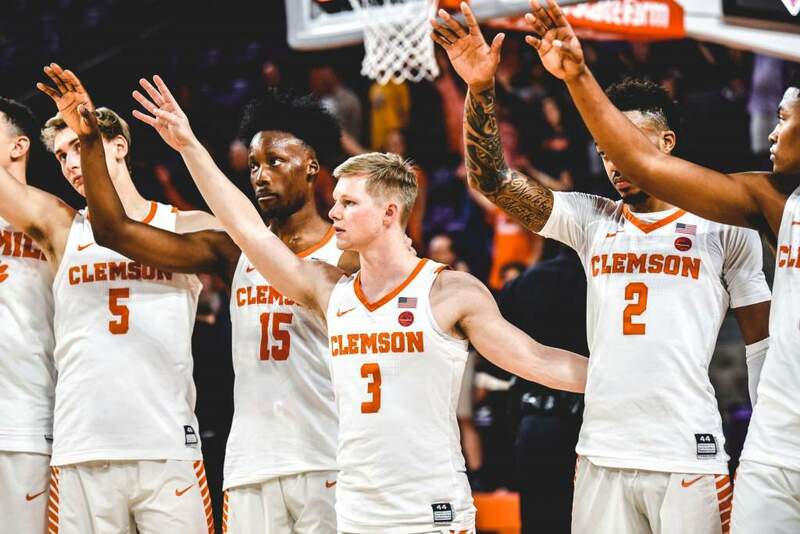 CLEMSON, S.C. — Clemson knocked down 13 three-pointers and held Mercer (5-5) to a 30% field goal percentage as the Tiger advance to 6-2 on the year and remain undefeated in the newly renovated Littlejohn Coliseum. Five players scored in double-figures to fuel Clemson’s 90-47 victory, the team’s largest margin of victory this season. Donte Grantham paced the Tigers with a game-best 19 points, six boards, a block and a steal. Jaron Blossomgame wasn’t far off with 16 points on the day while Shelton Mitchell did it all for Clemson, tallying 13 points, seven rebounds, and five assists. Gabe DeVoe matched Mitchell’s 13 points with Avry Holmes not far behind with 10 on the day. Together, the five double-digit scorers shot 49% from the floor and knocked down 17 of their 22 free throws. They combined for 11 of Clemson’s 13 buckets from beyond the arc, which is just three, three-pointers shy of Clemson’s program record of 16 threes in a single game. Defensively, the Tigers controlled the Bears throughout the contest as Mercer suffered scoring droughts as long a eight minutes. Clemson out-rebounded Mercer 44-35 while forcing 18 turnovers, earning eight blocks and 11 steals. Off Mercer’s 18 turnovers, the Tigers capitalized for 25 points. Mercer managed to stay competitive until the Tigers took off on a 24-7 run with eight minutes left in the first half to control a 49-25 advantage at halftime. 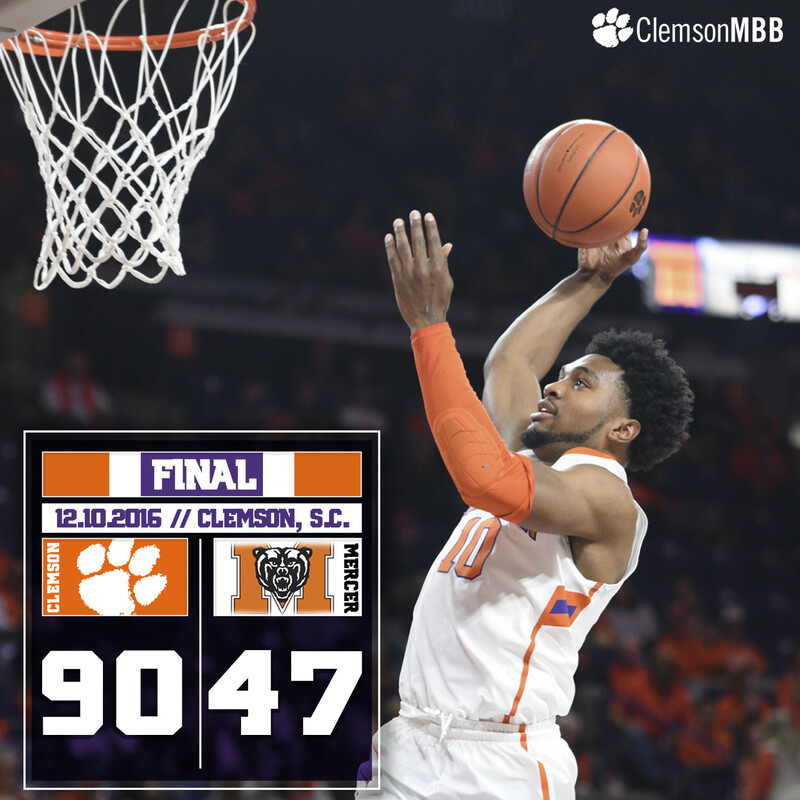 Blossomgame led the charge with 10 points while Grantham, DeVoe, Mitchell and Holmes combined for the other 14. The Tigers finish off a five-game homestand on Tuesday, Dec. 13 against SC State, with tipoff scheduled for 7 p.m.